When we make doll clothes many times we try to make the dress be a confection for the eyes. We add ribbons, lace and bows to make our doll look as pretty as possible. Why not add some jewelry to the outfit? It's easy and adds the perfect finishing touch. Making jewelry can be as easy as stringing some beads to make a simple necklace or bracelet. 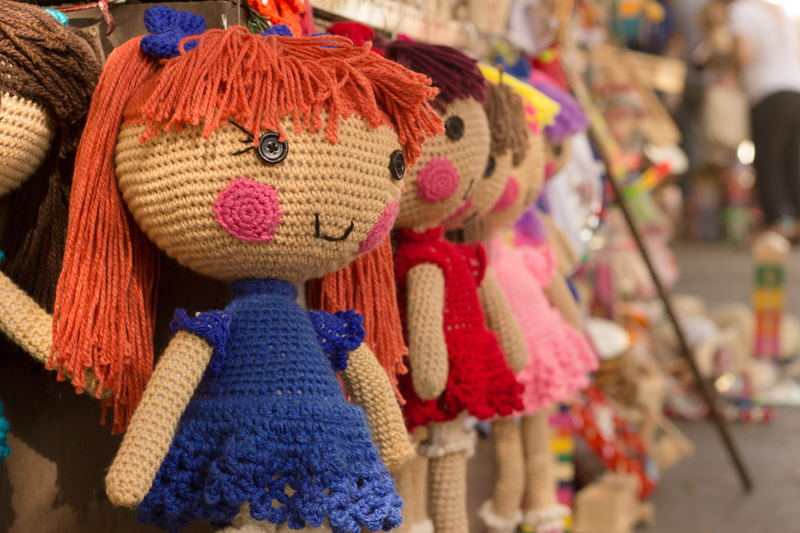 Craft stores have such a beautiful selection of beads and charms for making jewelry for yourself, why not for your dolls? Wouldn't it be a fun idea to make some matching jewelry for your favorite little girl and her favorite doll? Here is a picture of my 15 inch Annie doll showing off her new jewelry. There are many patterns and kits available for making beautiful and intricate designs, and I encourage you to try your hand at it. To get you started, I have adapted a design originally intended for adults, that will work for dolls, and little girls as well. Here are instructions for a crocheted bead bracelet. about 1/4 tube of seed beads, color of your choice, I used pink. #10 cotton crochet thread - you won't need much - a great way to use up leftover thread. size 7 steel crochet hook. Measure around your doll's wrist. This is how long you'll need to make your bracelet. Because it is crocheted there will be some give in the finished bracelet so you'll be able to slide it over her hand. Begin by stringing the beads onto the crochet thread while it is still attached to the ball. You will bring the beads up to add into the stitches as you crochet. To start crocheting, chain 7 and turn. Row 1 - Single crochet in the second chain from the hook, and in all chains across - 5 single crochets - chain 1 and turn. Row 2 - Single crochet in first single crochet, *insert hook in the next single crochet and pull up a loop (first half of a single crochet), slide 3 beads up next to the hook and finish the single crochet,* repeat between * and * twice more, 1 single crochet in last single crochet, chain 1 and turn. Row 3 - Single crochet across, chain 1, turn. Repeat rows 2 and 3 until your bracelet is the correct length. End with a row of single crochet. Crochet or sew the ends together and weave in the thread ends. Enjoy! To make the necklace shown in the photo, I simply strung the beads onto the same crochet thread and tied the ends. Make sure your necklace is long enough to slip over your doll's head. This jewelry is not appropriate for infants and toddlers, as it could be a choking hazard. If you make it for a child, be sure the child is old enough to keep it out of their mouth.